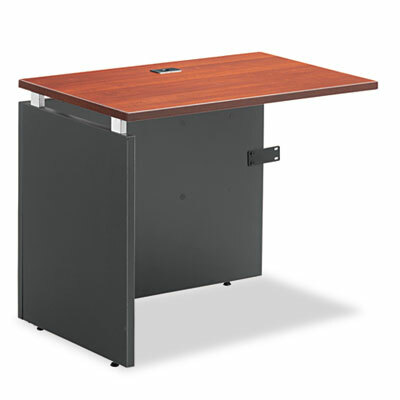 Elevated woodgrain laminate top is complemented by a charcoal base. Reversible for right- or left-handed configurations. Accepts hanging pedestal and/or keyboard shelf. Elevated woodgrain laminate top is complemented by a charcoal base. Universal application as either Return or Bridge. Reversible for right- or left-handed configurations. Accepts hanging pedestal and/or keyboard shelf. Disclaimer Statement(s) Desk and Return sold and shipped separately—ORDER BOTH.